The 1974 Norfolk mid-air collision happened on 9 August 1974 at Fordham Fen, Norfolk, England when a Royal Air Force McDonnell-Douglas F-4M Phantom FGR.2 of No. 41 Squadron RAF (41 Sqn) collided with a Piper PA-25-235 Pawnee crop spraying aircraft. All three aviators were killed, the pilot and navigator of the Phantom and the pilot of the Pawnee. The Phantom pilot was a Royal Air Force Group Captain and station commander of RAF Coningsby. It was the first collision between a civil and military fast jet aircraft in the United Kingdom low flying military training system. One of the aircraft also reported a temporary weapons systems failure while the crew was preparing to open fire. The 205th Tactical Fighter Squadron (第205飛行隊 (dai-ni-byaku-go-hikoutai)) was a squadron of the 6th Air Wing of the Japan Air Self-Defense Force between 1965 and 1981. It was based at Komatsu Air Base, in Ishikawa Prefecture, Japan. It was equipped with Lockheed F-104J/DJ aircraft. Its traditions were passed on to the McDonnell Douglas F-4 Phantom II-equipped 306th Tactical Fighter Squadron. Ghafour Jeddi Ardabili (Persian: غفور جدی اردبیلی‎; 1945 – 1980) was a professional McDonnell Douglas F-4 Phantom II pilot in the Air Force of Iran. He had a role in the early months of the Iran-Iraq War to stop Iraqi tanks from further advancing into the western Iranian territories. His statue is placed in Tehran by City Council and hometown Ardabil. Hughes Airwest Flight 706 was a regularly scheduled flight operated by American domestic airline Hughes Airwest, from Los Angeles, California, to Seattle, Washington, with several intermediate stops. On Sunday, June 6, 1971, the Douglas DC-9-31 serving the flight collided in mid-air with a McDonnell Douglas F-4 Phantom II of the United States Marine Corps over southern California, killing all passengers and crew on the DC-9. Flight 706 had departed Los Angeles just after 6 pm en route to Seattle, with scheduled stopovers in Salt Lake City, Utah; Boise and Lewiston in Idaho; and Pasco and Yakima in Washington. The F-4 Phantom was arriving at Marine Corps Air Station El Toro near Irvine, California at the end of a flight from Naval Air Station Fallon in Nevada. The F-4 pilot and all 49 passengers and crew on board the civilian airliner perished in the collision over the San Gabriel Mountains, near Duarte, California. 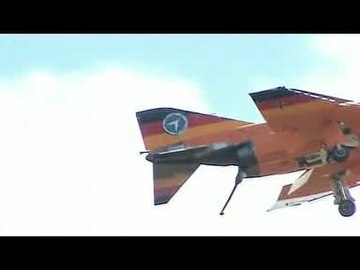 Only the RIO (Radar Intercept Officer) of the F-4 survived. The crash of Flight 706 prompted the United States Armed Forces to agree to both reduce the number of military aircraft operating under visual flight rules in civilian air corridors, and to require military aircraft to contact civilian air traffic controllers. The Israeli Air Force Museum is located at Hatzerim Airbase in the Negev desert. The museum was established in 1977 and has been open to the public since 1991. The museum displays a variety of Israeli Air Force and foreign aircraft, as well as anti aircraft arms. This is a list of Israeli Air Force aircraft squadrons. The Royal Australian Air Force (RAAF) operated 24 McDonnell Douglas F-4E Phantom II fighter-bomber aircraft in the ground attack role between 1970 and 1973. The Phantoms were leased from the United States Air Force (USAF) as an interim measure owing to delays in the delivery of the RAAF's 24 General Dynamics F-111C bombers. The F-4Es were considered successful in this role, but the government did not agree to a proposal from the RAAF to retain the aircraft after the F-111s entered service in 1973. The F-4C variant of the Phantom II was among the aircraft evaluated by the RAAF in 1963 as part of the project to replace its English Electric Canberra bombers. The F-111 was selected, but when that project was delayed in the late 1960s due to long-running technical faults with the aircraft, the RAAF determined that the F-4E Phantom II would be the best alternative. As a result of continued problems with the F-111s, the Australian and United States Governments negotiated an agreement in 1970 whereby the RAAF leased 24 F-4Es and their support equipment from the USAF. The RAAF's F-4Es entered service in September 1970, and proved to be highly effective. Used in the air-to-ground role, they prepared aircrew to operate the sophisticated F-111s, and the intensive training program undertaken using the aircraft improved the RAAF's professional standards. One of the Phantoms was destroyed in a flying accident in June 1971, and another was repaired by the RAAF after it sustained heavy damage during a crash landing. The 23 surviving aircraft were returned to the USAF in two batches during October 1972 and June 1973. F-4 Phantom II non-U.S. operators are the non-U.S. nations with air forces that operate or used to operate the McDonnell Douglas F-4 Phantom II. The Phantom II entered service with the U.S. military in 1960 and served until 1996. During this time it was the primary interceptor, air superiority fighter and fighter bomber with the U.S. Navy, Marines and Air Force. The Phantom II was exported to 11 other nations, and continues to serve in a military role in some parts of the world. There are many examples of the McDonnell Douglas F-4 Phantom IIs on display around the world, often in aviation museums and at facilities that once operated the McDonnell Douglas F-4 Phantom II. A few F-4s are also preserved as gate guardians, and some are also owned privately. The United Kingdom operated the McDonnell Douglas F-4 Phantom II as one of its principal combat aircraft from the 1960s to the early 1990s. The UK was the first export customer for the Phantom, which was ordered in the context of political and economic difficulties around British designs for the roles that it eventually undertook. The Phantom was procured to serve in both the Fleet Air Arm and Royal Air Force in several roles including air defence, close air support, low-level strike and tactical reconnaissance. Although assembled in the United States, the UK's Phantoms were a special batch built separately and containing a significant amount of British technology as a means of easing the pressure on the domestic aerospace industry in the wake of major project cancellations. Two variants were initially built for the UK: the F-4K variant was designed from the outset as an air defence interceptor to be operated by the Fleet Air Arm from the Royal Navy's aircraft carriers; the F-4M version was procured for the RAF to serve in the tactical strike and reconnaissance roles. In the mid-1980s, a third Phantom variant was obtained when a quantity of second-hand F-4J aircraft were purchased to augment the UK's air defences following the Falklands War. The Phantom entered service with both the Fleet Air Arm and the RAF in 1969. In the Royal Navy it had a secondary strike role in addition to its primary use for fleet air defence, while in the RAF it was soon replaced in the strike role by other aircraft designed specifically for strike and close air support. By the mid-1970s it had become the UK's principal interceptor, a role in which it continued until the late 1980s. The McDonnell F3H Demon was a subsonic swept-wing United States Navy carrier-based jet fighter aircraft. The successor to the F2H Banshee, the Demon was redesigned with the J71 engine after severe problems with the Westinghouse J40 engine that was part of the original design but ultimately abandoned. Though it lacked sufficient power for supersonic performance, it complemented daylight dogfighters such as the Vought F8U Crusader and Grumman F11F Tiger as an all-weather, missile-armed interceptor until 1964. It was withdrawn before it could serve in Vietnam when both it and the Crusader were replaced on Forrestal-class and similar supercarriers by the McDonnell Douglas F-4 Phantom II. McDonnell's Phantom, which was equally capable against ground, fighter and bomber targets, bears a strong family resemblance, as it was conceived as an advanced development of the Demon. The supersonic United States Air Force F-101 Voodoo was similar in layout, but was derived from the earlier XF-88 Voodoo, which also influenced the Demon's layout. Naval Air Museum Barbers Point is a military museum in Kapolei, Hawaii.The museum preserves the history of the co-located Naval Air Station Barbers Point. Its exhibits include former U.S. Navy, U.S. Coast Guard, and U.S. Marine Corps aircraft including the McDonnell Douglas F-4 Phantom II, Douglas A-4 Skyhawk, Lockheed P-3C Orion, and Sikorsky UH-3H Sea King, among others.Established in 1999, it is open to visitors by appointment only. The Rockwell XFV-12 was a prototype supersonic United States Navy fighter which was built in 1977. The XFV-12 design attempted to combine the Mach 2 speed and AIM-7 Sparrow armament of the McDonnell Douglas F-4 Phantom II in a VTOL (vertical takeoff and landing) fighter for the small Sea Control Ship which was under study at the time. On paper, it looked superior to the subsonic Hawker Siddeley Harrier attack fighter. However, it proved unable to produce enough thrust for vertical flight, even with an installed engine delivering more thrust than its empty weight, and the project was abandoned. The Vought XF8U-3 Crusader III was an aircraft developed by Chance Vought as a successor to the successful Vought F-8 Crusader program and as a competitor to the McDonnell Douglas F-4 Phantom II. Though based in spirit on the F8U-1 and F8U-2, and sharing the older aircraft's designation in the old Navy system, the two aircraft shared few parts.